Our Clevis Clamp with cable allows for glass, acrylic, and other light-weight materials up to 10 mm thick to be hung from the ceiling. 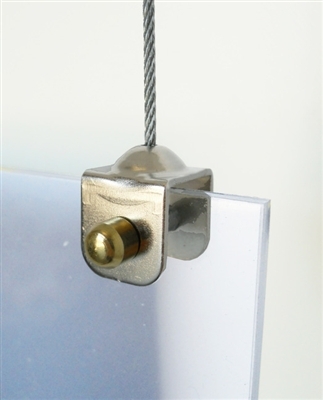 Fit cable on a mounted ceiling gripper then attach a clevis clamp through a pre-drilled panel with 1/6" opening to hang. Clamp Panel: 1/2" x 1/2"
Cable Diameter: 1.5 mm / 1/16"
Cable Length: 1.0 m / ~40"